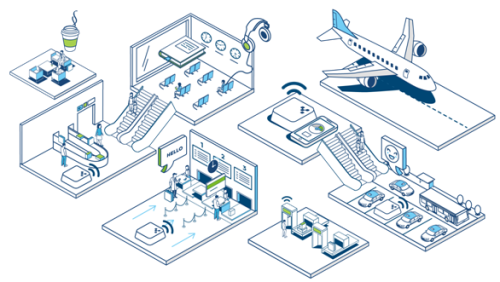 In a series of blogs on BLE, we have discussed in detail about the Bluetooth technology, its classifications, its popular variant BLE and various hardware design considerations such as SoC selection, RF layout and Antenna selection. These posts were primarily in perspective of hardware design. Bringing up the software functionality is mostly straight forward as the stack is provided by the silicon vendor and will run with little or no modifications. But improving and optimizing the performance is a different story altogether. In this series of blog, we will discuss about various parameters related to BLE operations and important considerations while working with BLE devices. Understanding the above aspects will help any developer to lower the device power consumption, increase the speed of connection and improve the reliability of data transmission and reception. In the following sections of this blog, we will discuss in detail about the BLE Advertisement process along with a practical example based on Embien’s eStorm-B1 Bluetooth Low Energy module by capturing the Advertisement packets using the nRF sniffer. It is important to know about the BLE physical layer, such that we understand the BLE communication better, because physical layer includes the actual RF radio and is in charge of sending the signals over the air. Bluetooth Low Energy is similar to classic Bluetooth where both of them use 2.4GHz spectrum but differ from each other with different modulation index. Classic Bluetooth uses 79 channels whereas BLE uses only 40 channels and are the channels of both are spaced differently. Due to this, the BLE and classic Bluetooth cannot communicate. But there are modules that can support both BLE and classic Bluetooth which operates by switching its modulation parameters and the channels. The 2.4GHz spectrum of BLE is divided into 40 channels (0 to 39) which extend from 2402MHz to 2480 MHz with 2MHz spacing. Among the 40 channels, BLE advertisement takes place in 3 channels (37, 38 and 39) and data exchange takes place in remaining 37 channels. The following image illustrates the channel layout of BLE with 3 advertising and 37 data channels. BLE advertisement mode by default is uni-directional and will be initiated only by the peripheral device through sending advertisement packets. The peripheral device will broadcast advertisement to every device around it. Connection can be initiated only by the central device (within the communication range of the peripheral device) to receive more information. 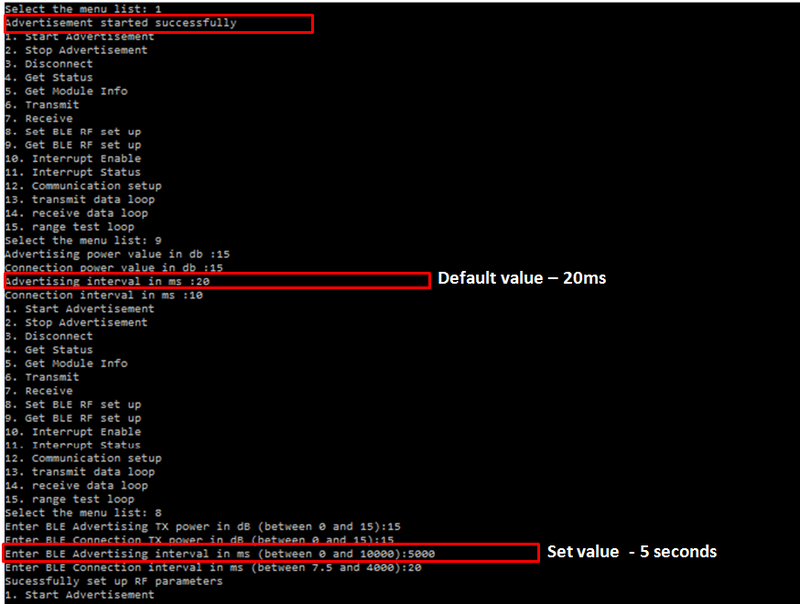 Only in connection mode, both the peripheral and central device can send packets. Connection cannot be done between two devices without using advertisements and central device cannot send any packets to peripheral device without a connection. 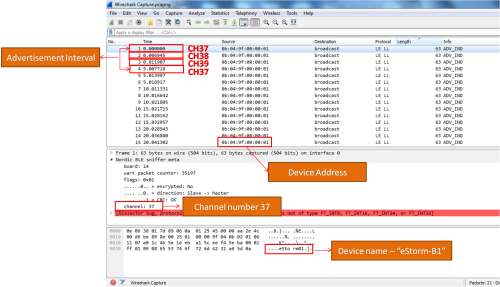 BLE peripheral device in advertisement mode will send advertisement packets periodically on each advertising channels (channel 37, channel 38 and channel 39) at a user defined interval called “Advertisement interval”. Setting advertising interval is the first and foremost task for any developer, since the value has great impact on the connection speed and power consumption. The advertising interval can be as short as 20 milliseconds or as long as 10.24 seconds. In practical case, the time interval between the advertisement packets will have a fixed interval set by the user and a random interval between 0 millisecond to 10milliseconds. This random interval will be added automatically in order to avoid collision between advertisements of different devices. A short advertisement interval will enhance the central device to find the peripheral device quickly. On the other hand, due to frequent radio operation the power consumption becomes higher. 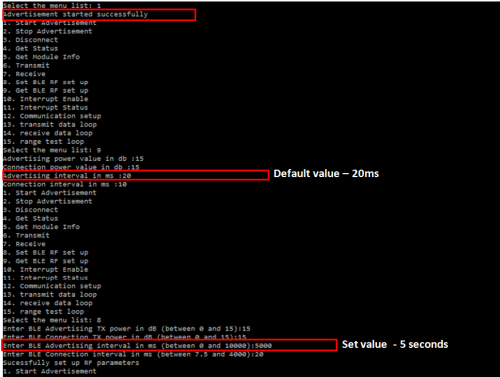 So the developer should set a value balancing the speed and power consumption. nRF Sniffer, a windows application from Nordic Semiconductor, together with Wireshark, is used for viewing the Bluetooth Low Energy communication between two devices using BLE. In this example, BLE advertisement packets sent from eStorm-B1 and the interval between two advertisements are sniffed. 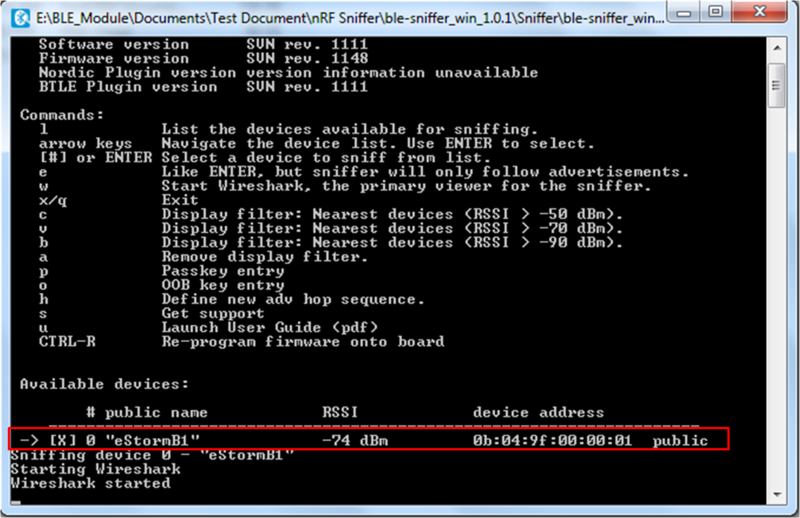 The following images are the screen shots that depicts the advertisement interval of 5 seconds being set in eStorm-B1 BLE module via “UART_BLE”, a windows console application and the Wireshark capture done via nRF sniffer application for observing the advertising packets and interval. BLE advertisements in general are of two types such as connectable advertisement or non-connectable advertisement. Connectable advertisement type is most common. It is not directed and it is connectable, which means a central device can connect to the peripheral that is advertising and it is not directed towards a particular central device. Non-connectable advertisement is a type used when the peripheral does not wants to accept connections and broadcast only the data in the form of advertisement. BLE Advertisement is more popular due to its significance of broadcasting data along with the advertisement. The advertisement packets itself has suitable bytes dedicated for custom data which can be used by a developer to broad cast data. The typical application of the non-connectable advertisement is the BLE tags and beacons. BLE tags are mainly used for asset tracking were the advertisement data broadcasted will help to track each device to which they are connected. Beacons evolved with the introduction of Apple’s iBeacon, targeted for proximity market such as shopping malls, retail showrooms, etc. Also we have Google’s Eddystone as an alternative for iBeacon for Android platforms. In both these technologies the device will transmit very small bits of data via BLE advertisement. In this blog we have briefly discussed about the BLE communication, BLE advertisement and advertisement interval. In the fore coming series of blogs, we will discuss in detail about the BLE connection parameters such as connection interval, slave latency, etc. Embien Technologies is a leading provider of embedded design services for the Semi-conductor, Industrial, Consumer and Health Care segments. Embien has successfully executed many projects like based on IoT such as healthcare Wearables, Gateways, and Data Analytics etc. Embien also offers a set of wearable design collections complete with electronics, firmware and Cloud that can be used to shorten product development costs and time significantly.